ICOMOS and the UCLG Culture Committee are partners in the #culture2030goal campaign. 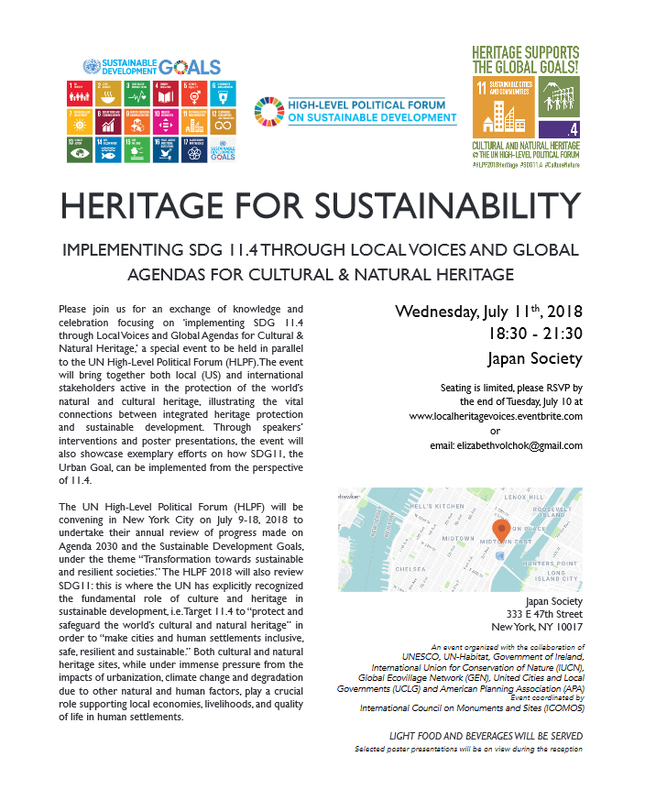 ICOMOS, together with UNESCO, Un-Habitat, IUCN, GEN, the Government of Ireland and UCLG, will organise on next 11 July 2018 (6:30pm - 9:30pm) at Japan Society an exchange of knowledge and celebration focusing on ‘Implementing SDG 11.4 through Local Voices and Global Agendas for Cultural & Natural Heritage’ a special event to be held in parallel to the UN-HLPF. 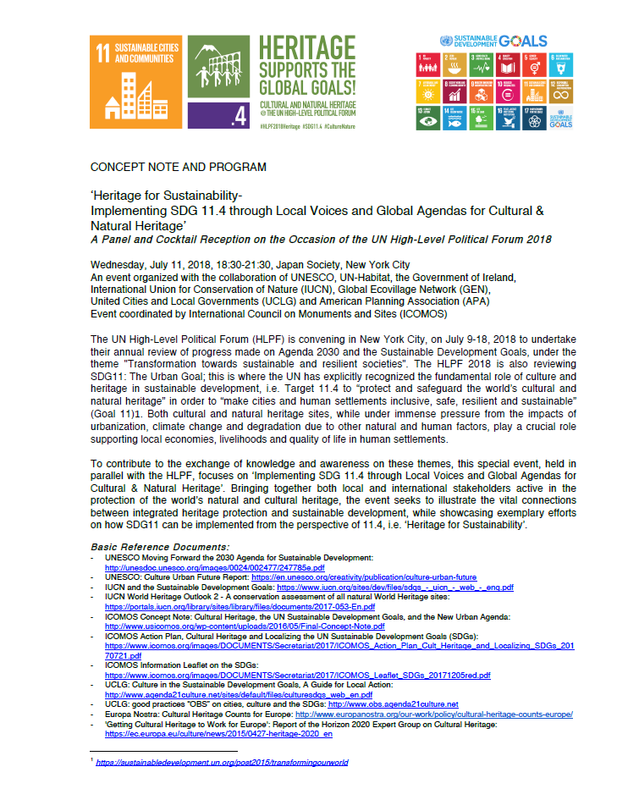 The event will bring together both local (United-States) and international stakeholders active in the protection of the world’s natural and cultural heritage, illustrating the vital connections between integrated heritage protection and sustainable development. 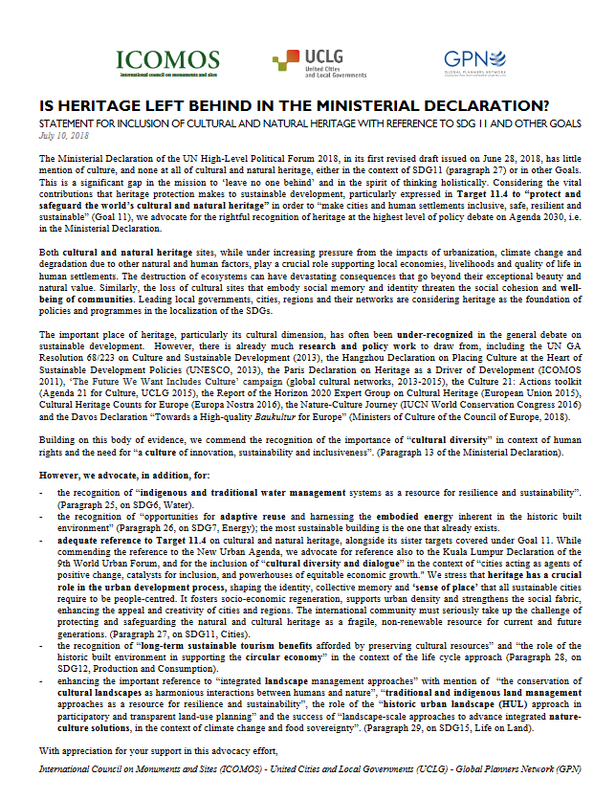 ICOMOS, together with UCLG, the Global Planners Network (GPN), Europa Nostra and the International Federation of Library Associations and Institutions (IFLA), signed a Declaration for the acknowledgement and the inclusion of culture as well as cultural and natural heritage into the UN HLPF 2018 Ministerial Declaration. Join and support!